Progressive Truck Driving School is Chicagoland’s premier truck driving school. We have three locations to choose from. Interested in becoming a student? Apply here. Watch recent video reviews from Progressive Truck Driving School graduates. Progressive Truck Driving School is Chicagoland’s premier truck driving school w/ 49,000 graduated students and growing. We have three locations to choose from. Interested in becoming a student? Apply here. Are you interested in getting your CDL? Take the first step and apply to Progressive Truck Driving School! These truckers have some serious driving skills. Want to see if you can get to the level of these amazing drivers? Apply now to get your CDL with Progressive Truck Driving School. Check out the turning skills by this truck driver! Are you interested in earning your CDL and seeing if you can make this turn? Apply to Progressive Truck Driving School. 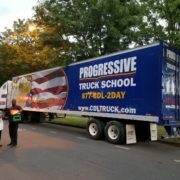 Founded in 1974, Progressive Truck Driving School, Inc. has grown to become one of the Chicago area’s premier truck driving schools. Progressive Truck Driving School offers training for CDL Truck Drivers Class A, Class B, and Passenger. Courses are a combination of classroom instruction and hands-on training. Interested in becoming a student? Apply here. Check out this video of the new Walmart Advanced Vehicle Experience Concept Truck! Complete this form to apply to Progressive Truck School! We found this cool YouTube channel for kids who are interested in trucking! Future CDL students of Progressive Truck School we hope!